You always have salad dressing when you're serving a fresh crisp green salad, so why not have a dressing for your fruit salad as well? It's surprisingly tasty and adds an incredible freshness to any combination of fruit. Just pour over berries, melons or other fruits for a wonderfully fresh light summer dessert! This is Marie's recipe and I absolutely LOVE it! Simply stir all ingredients together and pour over your favorite diced fruits. 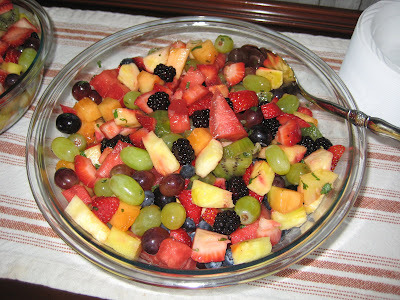 Since I'm all about presentation, I like to use fruits that are different colors, specifically blueberries, strawberries, pineapple, kiwi and grapes. YUM! If you'd like to make a citrus salad, such as oranges or grapefruit, just omit the lime juice. There's no need to add the lime since you already have enough citric acid in the dish. Be sure to "Supreme" the grapefruit or orange segments. This just means slicing in between the membranes to harvest the pulp segments and leaving the membranes behind.